It’s been a vexing challenge to try to explain the blockchain and its impact to non-technical audiences. Software engineers get it, as they marvel at the technological inventions, innovations and possibilities that are enabled by blockchain technologies. But most of the rest of us are still perplexed at best, and scratching our heads about its meaning. The challenging part about explaining the blockchain is that it’s a fundamental technology that impacts other technologies. Technology disrupting technology! And it touches several aspects of business, government, law and society. We can start to understand the blockchain by going to its first principles, and focusing of what it is, in addition to what it enables. What it enables is largely works-in-progress, so it makes it even more challenging to visualize its effects, unless you are in the forefront of these early implementations. I went back to what I’ve been writing about the blockchain to try and summarize everything we know about blockchains and their impact into a single infographic, and this article I wrote for Forbes almost a year ago stood out, so I encourage you to read it (or re-read it), How The Cryptoconomy Will Be Created. So, here the Infographic, followed by a narrative. The blockchain is a meta technology because it affects other technologies and it is made up of several technologies itself. So, we can think of it as an overlay of computers and networks that are built on top of the Internet. It is a new type of database that shatters the current database/transaction processing paradigm. 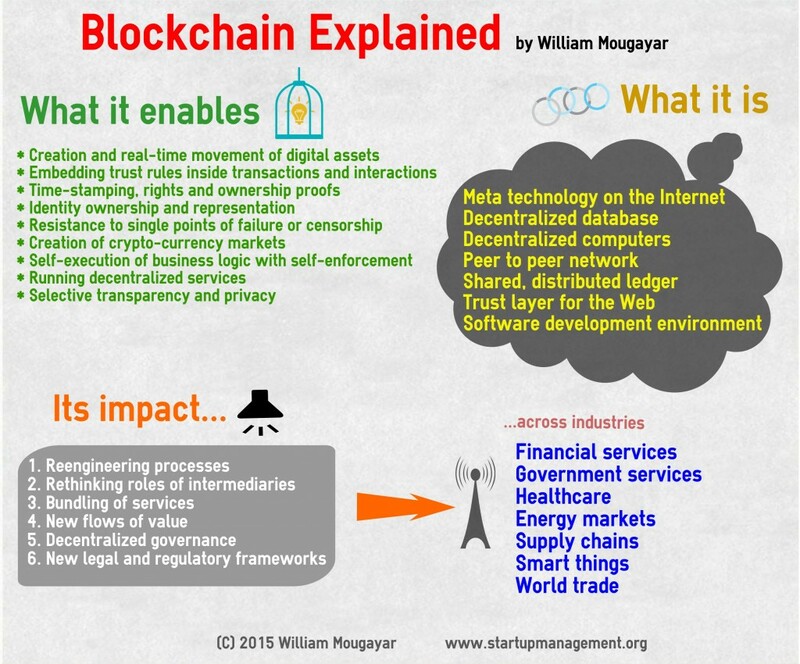 I have written about this topic, The Blockchain is the New Database, Get Ready to Rewrite Everything. From a physical perspective, networked computer servers really power any blockchain. But developers don’t need to set-up these servers, which is part of the magic of a blockchain. As contrasted with the web where an HTTP (Hypertext Transfer Protocol) request is sent to the server, with blockchain apps, the network makes a request to the blockchain. Architecturally, the base layer of the blockchain is a peer to peer network. The blockchain pushes for decentralization via peer processing, not central processing, via thousands of nodes. The network is really the computer. You verify each others transactions at the peer to peer level. In essence, a blockchain could be regarded as a thin computing cloud that is truly decentralized. Although being a distributed ledger of transactions is a popular way to describe blockchains, and some see it as the killer app, it is only one of its characteristics. This ledger can be shared across multiple parties, and its parts can be private, public or semi-private. This may sound abstract, but it is a key aspiration of blockchains to become a dial-tone for trust-based services. Blockchain technologies are numerous and a novelty for developers. This new set of development tools is an exciting event for software engineers. The blockchain includes technologies for building decentralized applications that are cryptographically secure. What does the Blockchain Enable? The blockchain is also a sort of assets exchange. Digital assets can be created, managed and transferred on this new network without delays by intermediaries to clear these transactions by verifying their viability. Not requiring human or central database intervention to enforce verifiability is a fundamental novelty. By including the rules that represent trust inside transactions, the blockchain becomes a new way to validate these transactions via the logic in the network, not via a database entry or central authority. Therefore, a new “trust factor” is created that is part of the transaction itself. The blockchain allows the time-stamping of documents representing rights or ownerships, therefore providing irrefutable proofs that are cryptographically secure. This in turn can enable a variety of applications to be built on top of these new seamless verification capabilities. Anonymous, pseudonymous or real Identities can be uniquely mapped on the blockchain, offering us the promise of owning our own identities, and not having it controlled by Google or Facebook. Because the blockchain consists of several decentralized computers and resources, there is no single point of failure, therefore the network is more resilient than centrally controlled infrastructures. And blockchains are typically censorship resistant, due to the decentralized nature of data storage, encryption and peer controls at the edge of the network. In most blockchains, there is a tokenization mechanism that is often tied to a crypto-currency that can be traded in exchange markets. Although it is not a mandatory requirement, the creation of a liquid marketplace is often one of the outcomes of successful blockchains. Because verification is done by the blockchain’s black box, and the trust component is part of the transaction, the end-result is a self-clearing transaction. Furthermore, the clearing and settlement of assets are merged together (more on bundling below). When you are running services on the blockchain, you are creating new value. An example might be the development of decentralized marketplaces based on a peer-to-peer protocol (e.g. OpenBazaar). But there will be a multitude of other blockchain services that will be available out-of-the box. Think about a new class of applications that will be emerging, as friendlier user interfaces get added to these underlying services. This is achieved via cryptographic technologies, and it will result in new levels of decentralized data privacy and security where transactions can be verified without revealing everything about them. Business process reengineering may be one of the most profound impacts of blockchains, but perhaps the most difficult too. Especially for large companies, the changes that are required are more daunting on the business process side than they are in terms of implementing the technology. Blockchain adoption will be 80% business process changes, 20% technology implementation. Just like the Internet was the first catalyst for re-thinking the role of intermediaries during the late 90’s (e.g. newspapers, television programs, travel agents), the blockchain is attacking another type of intermediaries: clearing houses, notaries, escrow services and any trust-based services that can be modified with the blockchain. Initially, blockchain services will look like “alternative” services that are adjunct to the mainstream, but this is how Internet services started as well. Suddenly, with gradual adoption, alternative services become mainstream. The pendulum is swinging between bundling and unbundling. With the Internet, unbundling was the preferred method to gain advantage and insert new services into existing value chains, e.g. Amazon’s unbundling of the book publishing industry allowed it to break into the old monopoly players. With the blockchain, we are learning how to re-bundle discrete parts that are benefiting from being together again. Example: clearing and settling financial instruments for capital markets trading. When the contractual component can be executed on the blockchain (via smart contracts), we start to benefit from collapsing time delays, moving towards real-time transactions, and freeing-up capital in the process. Value is more than just money. And the blockchain is a perfect exchange platform for digital value. If it can ride on the Internet, the resulting combustion will be digital value that can move fast, freely, efficiently, and cheaply. Therefore, the blockchain is a new “value exchange” network. One representation of decentralized governance is depicted by the arrival of Distributed Autonomous Organizations (DAO) whose governance and operations run on the blockchain. Arguably, this could be the epitome of business decentralization. For the blockchain to prosper, we will need to lower the legal and regulatory barriers to adoption and propagation, and amend existing frameworks that may be in the way. I don’t believe we can get rid of regulations, but I’m hopeful we can adapt what needs to be adapted, accordingly. There is hardly anything on earth that will not be affected by the blockchain, but these are the initial areas that will be affected: financial services, government services, healthcare, energy markets, supply chains, smart things, and world trade.